Emojis seem to be everywhere today…not only on social media, but showing up as pillows, candies, cake pops…you name it. It was only a matter of time until they showed up in a movie 😉 This Emoji snack mix is something that you can munch on while watching the movie, or just as an after school snack or party snack. It’s so much fun that your kids will love it! 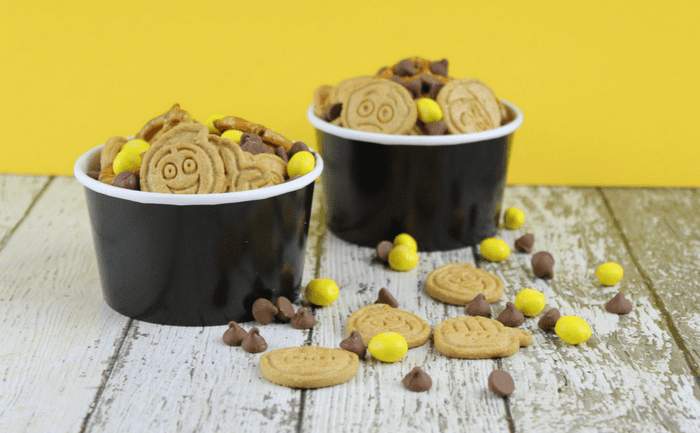 This emoji snack recipe is super easy to make, which is great for moms. You can even mix up a big batch to store in an airtight container, so that your kids have a supply of this yummy snack mix whenever they need something to tide them over until dinnertime. 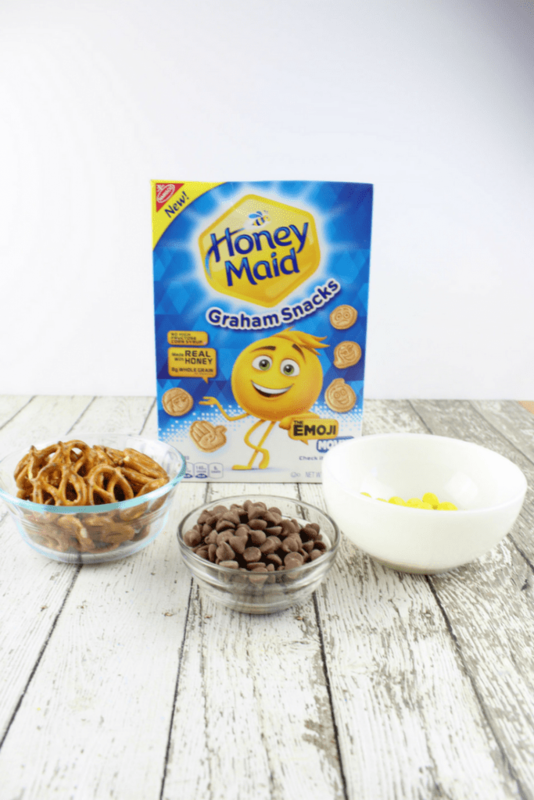 The ingredients are easy to find in mostly any store: Honeymaid Emoji Movie Graham Snacks (affiliate link), yellow M&M candies, pretzel twists, and chocolate chips. Just pour all the ingredients into a large mixing bowl, and stir to combine. It’s that easy! Transfer to small serving bowls, or to a large airtight container to save the mix for later. 1/2 cup chocolate chips for the poop emoji! Combine all of the ingredients in a large mixing bowl and gently toss until well mixed. Transfer to your serving bowl(s) and ENJOY!! 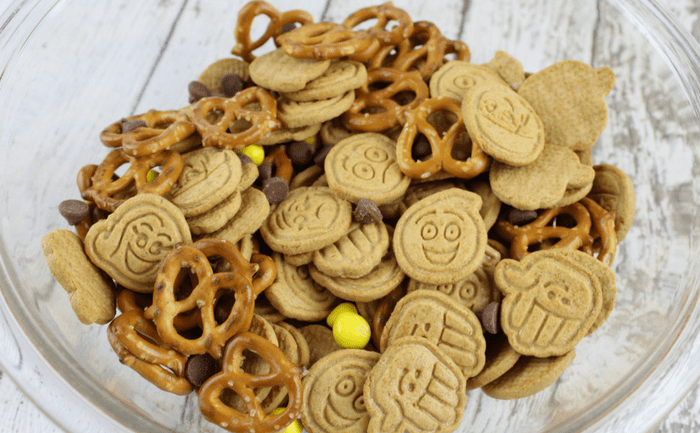 If you’re throwing an Emoji-themed party, this snack mix would make a great accompaniment…just place the mix into individual bowls for each guest or keep in the large mixing bowl and let the guests serve themselves. It could also make a fun party favor…just place some of the emoji movie snack mix into small plastic bags, tie with a coordinating ribbon and let the guests take it home to enjoy later! The combination of the sweet graham cracker snacks and chocolate candies and the salty pretzel twists makes for a great snack. And the emoji crackers are super fun to eat because you never know which one will you’ll get next! 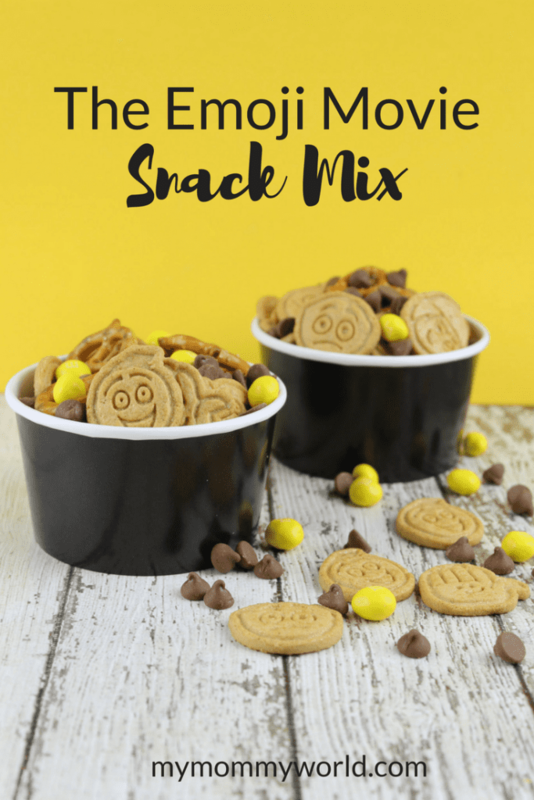 I hope you and your kids will enjoy this Emoji Snack Mix! I like the combination of salty and sweet. This snack mix looks like it would be perfect. Thanks for sharing it!